We're in a sort of strange weather phase right now. Tomorrow is the first day of autumn, and I'm ready for it. We planted our mums by the mailbox, I'm craving all kinds of soups and pumpkin breads, and I'm definitely ready for some cooler weather. But we live in South Carolina, and it is still pretty hot here. Yesterday I laid out for a while but then it got even too hot for that. Caleb also harvested our first watermelon from our garden yesterday. As much as I'm ready for fall, it's more like a not-so-oppressively-hot summer. 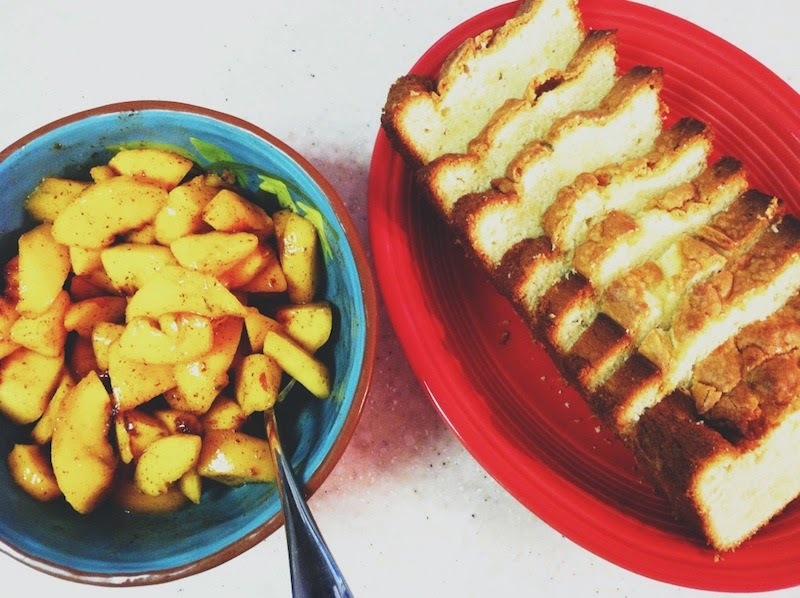 I hosted a ladies' night for our small group the other week, and I made this pound cake and macerated peaches to top it with. Both were a hit, and I'm pleased to have an easy pound cake recipe. We still have peaches on sale here, but if you don't, I'd tuck this recipe away for next year. Heat oven to 350 degrees. Lightly butter and flour a 4 1/2-by-8 1/2-inch loaf pain. In a large bowl using an electric mixer, beat butter and sugar on medium-high until very light and fluffy, 7 minutes. Scrape down bowl and beat 1 minute more. Add vanilla, then gradually add eggs, beating well and scraping down bowl as needed. With mixer on low, add salt, then gradually add flour, beating well to combine and scraping down bowl as needed. Transfer batter to pan and bake until a toothpick inserted in center of cake comes out with a few moist crumbs attached, 65 minutes. Let cool in pan on a wire rack, 1 hour. Remove cake from pan and let cool completely on rack before slicing. Stir together first 8 ingredients in a large bowl. Add peaches; toss gently to coat. Cover and chill 1 hour.